Zoidberg commentates instead of Billy. He constantly points himself out and says what a good actor he is. Identifying the cartoon at the beginning as Koko The Clown. The origin of the story was a idea with Bender crashing a tanker into a planet. Fry was going to draw comics more often. Pointing out Phil Hendrie as Free Waterfall Sr. and that the next family member will appear in a season four episode. The family members always die at the end of their appearances. The Captain's Handbook has a pop-up sextant. Sci-Fi generally ignores the fact that spaceships can move in three dimensions not just two. One of the Star Trek movies addresses this. Design of the hat is similar to that of Captain Crunch (US breakfast cereal mascot). The food is very detailed. File photos are always unflattering in cartoons. He was more like Foghorn Leghorn in earlier designs. Early episode names included Emperor Benguin. The video game system has antenna and a wire. The episode is very environmental. They wanted to make a point about hunting, but they weren't sure what their point was. These types of episodes need arguments for both sides in the stories. There is an orange line between the black and white of the penguins. They are all hand drawn. Futurama has more gasps per minute than any other show. The Penguin music from Batman could not be obtained. After winning an environmental award the previous year for "The Problem with Popplers", they were sent a reminder to enter again and this episode was suggested. They entered it but failed to be nominated. Matt Groening: [after seeing the Fing-Longer invented in reality]: I thought all of season three was a dream. David X. Cohen: John, how come you're so good at playing drunk? John DiMaggio: It's something I, uh... I don't know, it's... You guys got any booze? Leela: [episode] ...with wind-chill it's 20 degrees below absolute zero. David X. Cohen: Take that physicists. A blow to your precious logic. 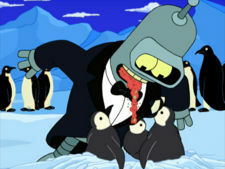 John DiMaggio: Hunting is great when you gotta kill off a lot of animals. Billy West: [as Zoidberg] It's even better when you have a thirty-aught-six and a snoot full of vodka. Billy West: [as Zoidberg] Look at where I'm not! This page was last edited on 29 April 2011, at 10:46.